The Guira Cuckoo (Guira guira) is a social, non-parasitic cuckoo found widely in open and semi-open habitats of eastern and southern Brazil, Uruguay, Paraguay, Bolivia, and north-eastern Argentina. It is monotypic within the genus Guira, and is related to the anis. It has whitish-buff underparts and rump, dark brownish upperparts, a broadly white-tipped dark tail that is relatively long, an orange-rufous crest, bare yellow ocular-skin (commonly fades in captivity), and a relatively heavy, orange-yellow bill. It is generally rather shaggy-looking and has a total length of approximately 34 cm (13 in). 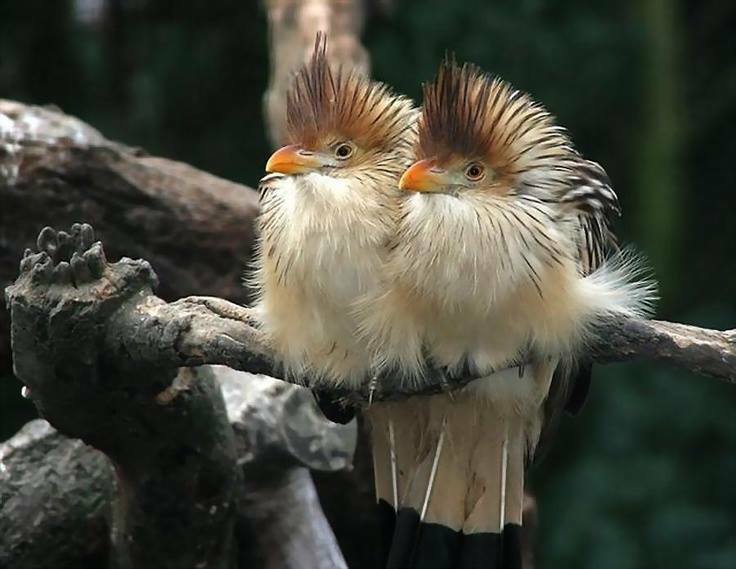 Like other members of the subfamily Crotophaginae, the Guira Cuckoo gives off a strong, pungent odour. The Guira Cuckoo is arboreal, but can frequently be seen on the ground, usually in flocks of 6 to 18 individuals. It is sometimes seen with other birds such as the Smooth-billed Ani (Crotophaga ani) whose behaviour is similar. The Guira Cuckoo is a bird of open habitats and therefore has expanded its range on human-altered wooded areas, being found even in suburban parks and gardens. It feeds on large arthropods, frogs, eggs, small birds (especially nestlings) and small mammals such as mice. As it is not an accomplished flier, mostly gliding or hopping from one perch to another – clumsier, but otherwise similar to the related Squirrel Cuckoo – it acts as an opportunistic predator, gathering small prey items on the ground or searching for them among branches. The Guira Cuckoo is often seen in small groups in open habitats, gliding from one treetop to another foraging, while vocalizing loudly. The bird’s call is unmistakable for being long and shrill, something between a long whistle and a wailing. The nest is built on a tree fork 2 to 5 m (7–16 ft) from the ground. The eggs (from 5 to 7) are dark green and covered with a chalky layer. They are incubated either in individual or community nests; in the latter one can find up to 20 eggs. Under community nests there are many broken eggs. The competition between young being great, mortality is significant.